When I came in, Doña Rosa was sitting on the dirt floor of the kitchen making tortillas. Her left leg extended from beneath her blue plaid dress to expose a muscular chocolate-colored calf that could belong to a woman half her age. She shifted to perch casually on a cement block to knead the corn dough – her flexibility and perky, mischievous smile take years off of her appearance. Doña Rosa and Don Alfredo are Ina’s next door neighbors. They have been loyal and supportive friends to Ina and Manuel and to Enlaces since they welcomed the couple into the neighborhood two years ago. Don Alfredo is a judge in town and works both at the rock quarry and in the fields. As they are the parents of ten children, Doña Rosa is a respected matriarch of much of the Tecuanipan community. They are teeming with knowledge of indigenous language, customs and practices. You’ll hear more about this impressive family as we talk about our other projects, for many of which they have offered both physical and informational support. 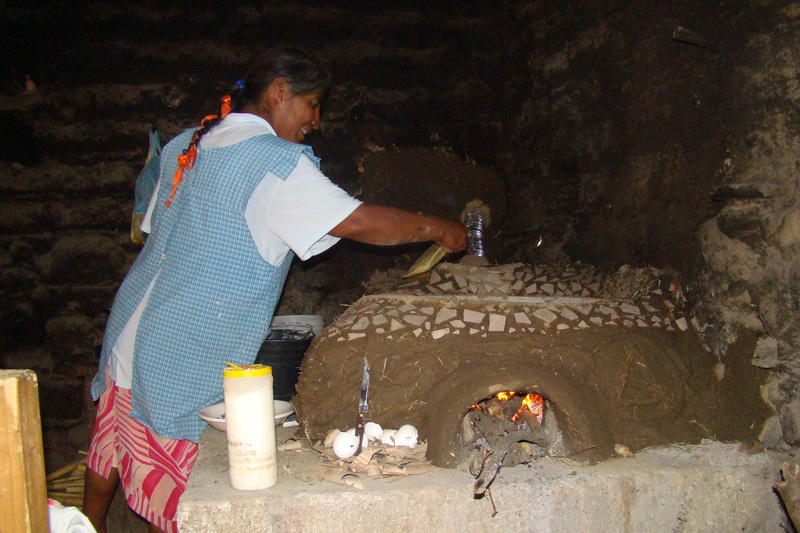 But for this particular blog post, I’d like to tell you how Doña Rosa’s cob stove came into existence. She sits in a dimly lit kitchen to make tortillas three to five times a week. Most women in Tecuanipan have a similar setup, or an outdoor smokehouse, and dedicate just as much of their time to the task. Doña Rosa had been wary of the undertaking of a new stove for about 8 months despite our persistence and propaganda. To be fair, it’s difficult to embrace change, especially when it’s coming from outsiders and you’re the first. The stove is heated mostly with wood, but supplemented with cheaper supplies like plastic Coke bottles, Styrofoam cups and saran wrap. The smoke that doesn’t escape through the thin gap between the cement wall and the corrugated tin roof slowly curls back into the kitchen, caressing and plastering to the walls and scraping Doña Rosa’s throat and eyes. But she deals with it. Everyone deals. This is just how it’s done. This preface might sound familiar. 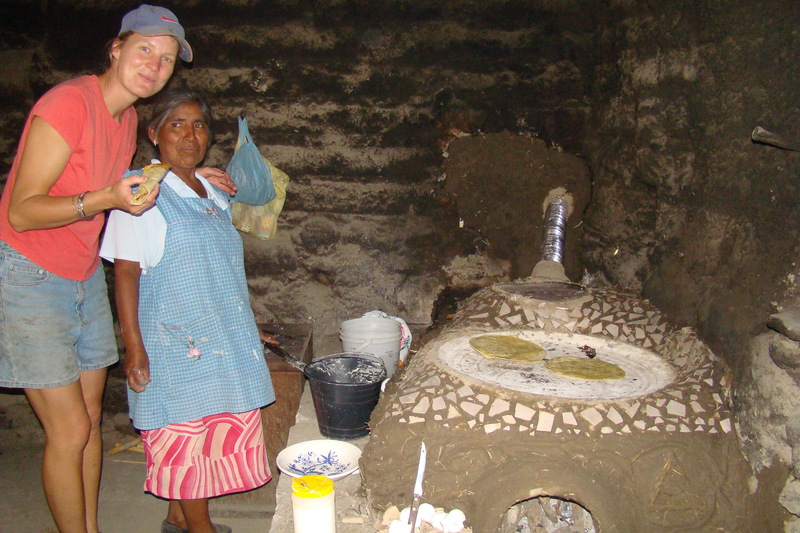 That’s because back in May we built two other cob stoves for CAM members – an environmental NGO in Morelos. With that practice and those trials and errors, we were able to approach Doña Rosa with a now seasoned, outstretched hand and show her proof of improvement and satisfaction. We also petitioned her support because this would be an exceptional educational service project for the students of Creighton and Brophy that were to visit in early July. It was a fantastic project. 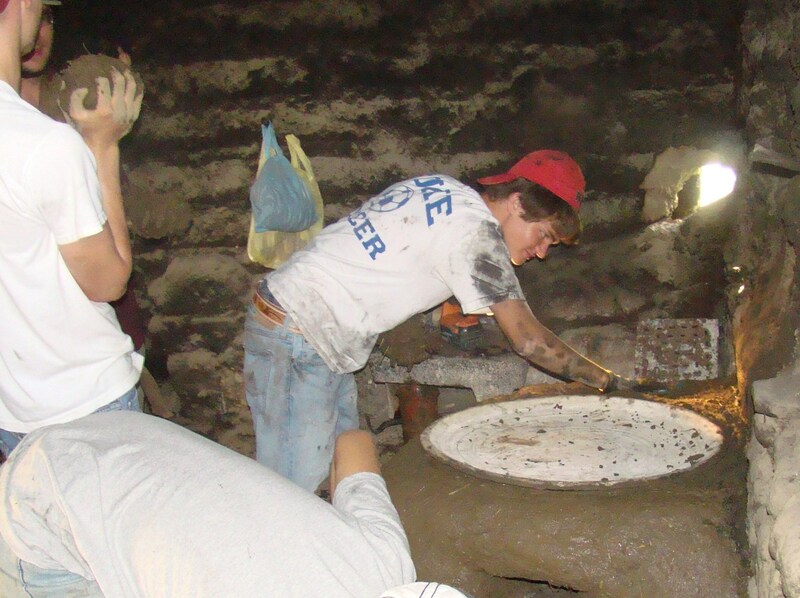 A couple of Creighton students took title to the job and worked with Doña Rosa to gut the old stove and make a new one. Naturally, (so to speak), this couldn’t have been accomplished without the Brophy guys sifting and stomping to make the cob. Cob is a natural building material made from a specific ratio of clay, sand/dirt, hay and water. It’s incredibly sturdy – a lot of the old houses here are built from adobe on similar principles. It’s also very thermic, indicating that it retains and releases heat very slowly. For houses, this means that it stays cool in daytime and warm at night, as well as regulating heat seasonally. 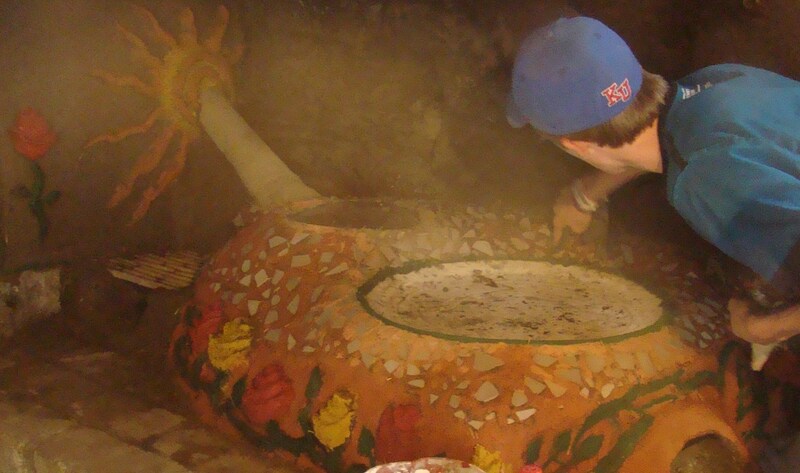 A cob stove insulates the heat very well without the material itself getting too hot. The Creighton guys worked for a number of days, first to build up the stove itself, leaving space in the middle for the wood. The heat would be closed in by the comal (the tortilla pan) and then rise through a channel to a second level to heat another comal. Using more cob, they insulated and fastened a chimney to the stove to siphon the smoke out of the kitchen. The boys really connected with Doña Rosa, and appreciated hearing her stories, watching her work and eating her delicious tlacoyos (tortilla pockets stuffed with beans). They found such pride and enjoyment in their efforts that they decided to take their work a step further and decorate the stove with roses, its patron’s botanical namesake. They experimented with natural pigments and the stove is absolutely gorgeous. So when I entered the kitchen last week to find her squatting at her other comal, I was confused and disappointed that she wasn’t making tortillas at her fancy new stove. She told me that while she’s overall satisfied with the project, it doesn’t quite heat as quickly the other stove, perhaps because there is too much cob and not enough open space beneath the comal. Therefore, she only uses it for family meals rather than social gatherings. Perhaps, she recommended, if we took out some of the center and built it up taller so that the smoke could build, it would heat up more quickly. More importantly, there was a powerful hail storm a few weeks back that destroyed the flexible tube serving as a chimney. Since that time, the smoke has been blowing back into the kitchen and lighting the stove has become a chore in itself. Upon hearing this, the crew took a peek and decided to replace the chimney with a stronger, rigid pipe and to extract some of the cob from the stove’s center to see if we can get it hotter. Today, in fact, we have a date with Doña Rosa to dance in the mud. With our support, she herself will modify the stove to suit her needs so that she feels more connected to it. Our goal is to find a balance between offering constant communication and support while providing the tools for our neighbors to ultimately maintain or even implement such projects themselves. Doña Rosa said she’s had a few inquiries about the stove from neighbors and family. She told them that she really likes it and would even recommend one, but only with its latest modifications to future cob stove owners. Community Links is an environmental, service-learning, immersion, volunteer, and international educational organization. 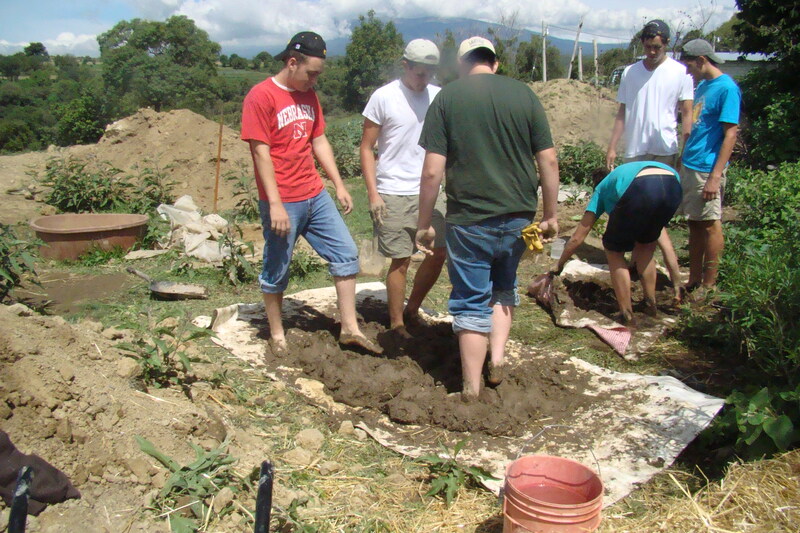 This entry was posted in Cob Cook Stove, Construction Projects & Natural Building, Mexico, Service-Learning Trips, Uncategorized. Bookmark the permalink.